Other Journalism, AEJMC News & Boblog. Also bookmarks & @bobstep on Twitter. It was originally more gateway than ego-trip. Now it's mostly historical. From 2004 to 2013, typing my last name in a browser to get here was a shortcut for students to access my now-defunct University of Tennessee website or, more recently, my Radford University pages for information about courses I was teaching in journalism, web design and related topics. JHeroes.com is short for "Newspaper Heroes on the Air," my book-in-progress, a blog and podcast about old-time radio's portrayals of newspaper editors, reporters and other journalists -- often heroic, sometimes not. Other Journalism, my main blog about journalism, online education and related topics, began elsewhere in 2002, but migrated to Wordpress after the demise of its original hosting service (see my OJ blog archive). At the AEJMC Newspaper Division, I have kept the group's original site for a decade, but added a blog-style AEJMC.us/news version to get more members involved. Summaries from its RSS feed should appear elsewhere on this page, after the "Other Journalism" headlines. Boblog is my "for fun" blog (dating back to November 2001), and it is where I write about music, including a growing number of instruments in the ukulele family. The page's widgets echo a few of my delicious.com bookmarks and Twitter (@bobstep) posts in the margin, more new technologies that I encourage students to try. I previously taught at Emerson College in Boston and the University of Tennessee in Knoxville, after getting two master's degrees at Wesleyan University and a doctorate at UNC Chapel Hill. At Radford, I became an assistant professor in fall 2007 as the university began a new RU School of Communication. I enjoyed it, mostly, but couldn't juggle the teaching load and my research the way younger faculty do. Newspaper Heroes on the Air (jheroes.com) was my main research project for the past few years, and I'm still having a great time working on it. Stop in and listen to some old radio shows streaming from the page. You may find them even more fun than my musings on the relationship between fictional and real-life journalism. Rather than redesign this whole (mostly archival) site, which used to have a two-column layout, I've shifted everything into a series of boxes that should display acceptably on mobile devices as well as large monitors. This page demonstrates a lot of Web features that students learn about in my classes, including use of style sheets to position columns of type, images, media players and boxes full of headline feeds. This first box is mostly about the page itself and its modest author. It has links to other sites I've built and things I've written over the years. In August 2007 I added the Scottish tartan background to celebrate moving to the "home of the Highlanders" -- Radford University in Radford, Va. I joined the Media Studies Department, which merged into our new School of Communication a year later. "Bob" (or "Robby") is short for Robert Bruce, and my becoming a "Highlander" might have some Glasgow ancestors smiling. Some even had the same name as a county next to Radford, my inspiration for using using one of the "Montgomery" clan tartans. Tools: This page is gradually migrating to up-to-date HTML5 and CSS, although there are still signs that it has been around for more than a decade. Over the years, along with plain hand-coding of HTML, I have tried popular blogging software and keep demos around, as mentioned above. I used Radio Userland for seven years, but later returned to Blogger and WordPress. I learned a lot about Drupal by building a Radford School of Communication site, since replaced by the university's decision to switch to a more expensive system called DayCQ5. A provider of free Drupal hosting that I used for classroom demos also has closed. Now the only remaining evidence of my five-year flirtation with Drupal is the page that was also my first try: a 2006 subscriber blog at the Knoxville community site KnoxViews. Along with teaching news writing and online journalism for three years at UT, my best contribution was as a catalyst, convincing a terrific programmer to master the Django toolkit to create TNJN.com. Before UT, I taught at Emerson College in Boston, where I started blogging. While belatedly finishing my dissertation, I joined the blogging group at Harvard's Berkman Center. Its blog server started out on Userland's Manila content-manager software before migrating to WordPress. I've also used free WordPress servers at Blogsome.com and WordPress.com, which I recommend to students these days as a great starting place, along with Blogger.com. Lots of links: My blogs and the right column of this page have long been ways to share links to interesting sites. My del.icio.us bookmarks do that in an even bigger way, with more than 1,000 links tagged with dozens of keywords for information categories you can combine. For instance, use http://del.icio.us/bstepno/django to see my links related to the site-construction framework by that name, or make that django+Holovaty for links related to a particular Django co-author. Until the late 1970s I pounded out news stories and college papers on Royal and Olivetti manual typewriters, but then The Hartford Courant put an IBM Selectric on my desk, followed shortly by one of its first Atex editing terminals. Ever since, I have been writing with and about computers, communication technologies, and the changes they have made in our lives. Even my research on media history and popular culture has relied on technology, most recently using blogging software to explore digital archives of newspapers, films and radio programs. When I left the newspaper for Wesleyan University, my Atex experience inspired me to visit the computer center and learn to use its mainframe to reorganize hundreds of pages of field notes for an anthropology/ethomusicology master's thesis. Next, I bought one of the first microcomputers sold through the university, an Osborne 1, in 1982, finished the thesis, and took Russ Walter's summer computer courses in 1983. Writing a newsletter for Wesleyan Osborne users and putting Russ's courses on the top of my resume landed me a job with a software company for a few years. Thinking about writing with computers (and how it was different from writing on paper) inspired me to do a 1988 master's essay about hypertext -- well before the Web spread that word around the world. Hanging out with MultiMate's programmers and at the computer center also had me interested in networks -- CompuServe, Prodigy, FidoNet, BiX, and the Wesleyan's connection to Usenet bulletin boards, as well as games like Adventure and Zork. When a boating magazine made me a better job offer than the computer magazines I'd been freelancing for, I even found an excuse to write about networked boat owners using CompuServe and Usenet. Over the magazine's low-speed modem, I read Tim Berners-Lee's and Marc Andreesen's announcements about the Web and the X-Mosaic browser on the alt.hypertext Usenet newsgroup. I wrote back, and was invited to beta-test the Windows version of Mosaic, but that would require a university-quality Internet connection, which the magazine didn't have. Ph.D., here I come. Thanks to that one more trip to grad school, I have been publishing on the Web since 1994 in one form or another, at least trying to keep track of useful resources. My beat had been "higher education" for most of my newspaper career, and I have been in and out of my own higher education ever since: Three times as a grad student (of culture + computers + communication) and then as a teacher, co-designing my first "Web" course as a teaching assistant in 1995 and teaching my first full course in 1998 at UNC Chapel Hill. This "stepno.com" domain and home page aren't just an ego trip. During the school year, the link on top takes students to course material at Radford. (Some previous academic creations are archived at stepno.com/unc and stepno.com/ec.) The rest of this page makes a handy parking space for past, present and future projects, personal news, and a box full of links I use myself and recommend to others, as well as a few mild-mannered amusements. As the banner suggests, you can reach me by e-mail as my first name @ my last name. My old Other Journalism Weblog was for thoughts, notes and headlines about news reporting, personal and "pro-am" community journalism on the Web, demos of technical tricks, and (less often) photos and news of personal events. The blog's left column has links to essay-style pages that I update from time to time, usually to preserve link that might get lost in the calendar-accessed daily blog entries. 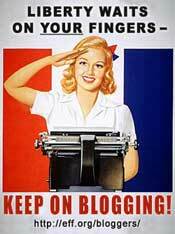 Blogging itself can be an "other journalism," hence the name. For several years I sorted out my newspaper-related blog items as a subset to link with the website I manage for a journalism educators' group, the AEJMC Newspaper Division. I've also saved my notes from my Digital Archives panel at the AEJMC 2006 national convention in San Francisco. In 2003 I started listening to audio weblog "podcasts" and in 2004 I started thinking about having one of my own, as well as writing what I knew about the history of that new medium. I decided to make it a "hobby" site about folk music, rather than pretend to be in the news business, and called it "podfolk." The testing was a success, but I decided I had no time to record audio podcasts. The site continued as an infrequent text-only blog about music, a place to hang some of my photos of musicians, and a "maybe someday I'll get back to it" item on the to-do list. In December 2010 I finally did launch a very different podcast, called JHeroes.com, already mentioned elsewhere on this page. The audio programs are hosted at the Internet Archive, so I just provide commentary and links. My Red Liner Weblog takes its name from the site's Harvard-crimson motif and the MBTA subway I used to take to get to Harvard's Berkman Center for the Internet & Society for Thursday night blogger meetings. (See the disclaimer in the blog's right margin.) Originally, "Red Liner" was a combination of notes on issues that came up at Berkman meetings and an excuse to learn to use the Manila community blogging system. For a while it continued mostly for classroom demonstrations and special situations. About Weblogs, my original year-2000 discussion page about the subject, survives, with many updates, as a sidebar to my main weblog. Newer pages there explain RSS Syndication, podcasting and video blogging. AEJMC Newspaper is the home page I update now and then for the newspaper division of the Association for Education in Journalism & Mass Communication, along with the newspaper-related weblog items I mentioned above. My old Boston-based "Resources for Reporters" collection of more than 1,200 Web bookmarks for my students, became a New England Society of Professional Journalists Resources database for a couple of years, but did not survive a change of SPJ sysadmins. My Emerson College faculty archive of pages created for courses in the Department of Journalism and the Institute for Liberal Arts & Interdisciplinary Studies at Emerson. Here are samples of student work in my online journalism classes. My grad school archive of pages built at the University of North Carolina School of Journalism & Mass Communication, 1994-1999. Old News: After four years of teaching in "all but the dissertation" limbo, I officially became "Dr. Bob" on Dec. 21, 2003, the day of winter graduation at the University of North Carolina School of Journalism & Mass Communication in Chapel Hill. More "who am I?" biographical information is at the top of my earlier home page. My old freelance/consulting resume may be of interest to a few people. An MIT conference paper based on a dissertation chapter about the visual evolution of WRAL OnLine. A rediscovered ASCII copy of my 1988 Wesleyan University MALS master's project, "Approaching hypertext: Cognitive models and usability of an electronic book technology." My oldest online "writing sample," a Hartford Courant feature story that was revived along with the New England Fiddle Contest. Contest organizers had both the story and a photo of mine in a press kit in 1980 -- and put them online 20 years later. For a journalism history conference, I started digging into The Evening Graphic of the Roaring Twenties, and I'm still researching its themes of visual literacy, newsroom cultures, evolving ethics, and blurred lines between news and entertainment. That work led me to become an associate of the Image of the Journalist in Popular Culture project. I'm investigating the presentation of newspaper reporters in classic radio dramas, movies and novels, including some connected to the Evening Graphic. Computers also blur lines between "real" and "virtual" communities. Those communities don't have to be as computer-oriented as engineers or bloggers. For example, I've written about online yacht clubs (for Soundings) and I've sung along with computer-assisted folksingers. Nuts and bolts: This page and those linked to it were created with a variety of computers and software, including an Android tablet and phone, and a (December 2007) cute little green laptop.org One Laptop Per Child machine in Linux terminal mode, as well as Macs and PCs with software including BBEdit and TextWrangler, Nvu, Notetab, Dreamweaver, Arachnophilia, Emacs, Pico (or Nano), and CMS systems including WordPress and the now-defunct Userland Radio. The network protocols SSH and Kerberos keep the connection secure, and have added to my Linux/Unix vocabulary. Archive.org is a great place to find old Web pages, copyright-free music, and even classic films like "His Girl Friday" (left), my favorite newspaper movie. Wikipedia offers anyone the opportunity to inform or misinform you, and you can do the same for them. Go to any page on a topic you know something about, then check its "history" and "discussion" tabs to see how the "facts" have changed. Craigslist is almost everywhere, including Southwest Virginia, where Radford ads appear in both the Blacksburg and Roanoke sections. J-blogs: My own blue, green and red weblogs have never attempted to match Jim Romenesko's daily newsbiz news or Jon Dube's Cyberjournalist. EditorsWeblog has an international news business focus; the Lost Remote knows what's going on with television news online, and Editor & Publisher still keeps track of the newspaper industry, including its online incarnation. Paid Content, Smartmobs and J.D. Lasica's Social Media add online media perspectives. Media watchdogs and support organizations: Fairness & Accuracy In Reporting, the Project for Excellence in Journalism, Investigative Reporters and Editors, the Center for Public Integrity, the Media Giraffe Project, and tthe Society of Professional Journalists. And more: The Poynter Institute, PR Watch, the American Society of Journalists & Authors, the National Association of Science Writers, the Reporters Committee on Freedom of the Press. Before the Web, we had to look for insider journalism news at the "JRs" -- American, Columbia -- to which you can add the Online Journalism Review: AJR, CJR and OJR. The Tartan, Radford student newspaper. RU Whim student magazine online. BlueRidge Muse, a topnotch "citizen journalist" weblog in Floyd. My "own" news media: The Hartford Courant, Soundings, the Raleigh News & Observer, where my Web-editing adventures began at Nando.net, and WRAL OnLine, where I did my dissertation research. In Boston my news bookmarks were Boston.com, the Boston Herald, Boston Phoenix, Community Newspapers, the Weekly Dig for an "alternative" edge, Adam Gaffin's Boston Online for local lore and news, and Dave Winer's ScriptingNews for the latest in the blog-tech world. In Knoxville, my "visit daily" news links were KnoxNews, The Daily Beacon, tnjn.com (which I had a small hand in starting), the Metro Pulse, WUOT-FM (NPR), WBIR TV, WATE TV, WVLT TV, plus KnoxViews and the KnoxBlab. While living in the Boston area, I was an early member of the Thursday night circle of bloggers that Dave Winer started at Harvard Law School's Berkman Center, a great introduction to blogs as more than personal online diaries or favorite-links lists. A blogger formerly known as South Knox Bubba helped me find my way to Knoxville, where he had assembled a whole Rocky Top Brigade of Tennessee bloggers under an inspiring constitution, single malt and all. "Daily Me" style feed aggregator services are now part of everything from Bloglines and Netvines, or my.Yahoo and i.Google, to most Web browsers. For more about the history of blogs, RSS, podcasts, aggregators and more aggregators, follow the links in the left column of my weblog. Slashdot and CNet, both good for a technical perspective on the news. For information about information, I visit Resource Shelf, among other places that I may get around to listing here. The Christian Science Monitor has thoughtful coverage of world and national issues. For more world and national news, I check the BBC, The New York Times, The Washington Post, Chicago Tribune, USA Today, Reuters, The Irish Times, and The Yomiuri Shimbun (in English). Also, CNN, MSNBC, NPR, AR, PRI, PBS, ABC News. The Associated Press Web pages, for today's news, enter through the Cape Cod Times or Mass Live. For more information, The Atlantic recognizes that an ocean, a good magazine and a good website have depth in common. Online, the magazine's searchable archives go back to the days when hypertext was just a glimmer in Vannevar Bush's eye. Other magazines in my life: Wired, Editor & Publisher, Mother Jones, Harpers, Adbusters, Dirty Linen, Sing Out!, Folio, InfoWorld, MacWorld, PC World and Soundings. Life is also music: The Mudcat Cafe, an amazing archive and conversation about of traditional and not-so-traditional songs. Live music: LEAF, near Asheville, N.C., is one of the best music and dance festivals I've been to -- so good that they have fall and spring editions. Other past haunts: In Connecticut, The Sounding Board and the Jovial Crew at the Griswold Inn. In the Boston area, The Burren, Club Passim, Johnny D's and Ryles. In Knoxville, the Bijou, WDVX Blueplate Specials, the Laurel Theatre, the Tennessee Theatre and the Timewarp Tea Room. 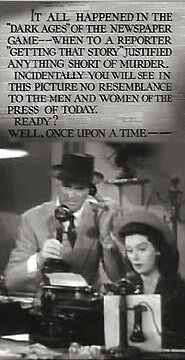 Archive.org has started allowing other Web publishers to "embed" video players in our pages, so here's "His Girl Friday." Grab some popcorn and click on the play button to start the Hollywood-plus-Web magic... or just go to http://www.archive.org/details/his_girl_friday_ipod and download a copy. That's probably a Sunday Boston paper or Springfield Union. 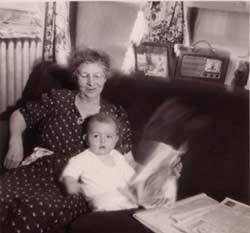 The past week's Daily Hampshire Gazettes are stacked on the radiator in this photo taken by my father. I started delivering the Gazette in junior high school and still remember columns by Arthur Hoppe making me laugh--the first byline that ever stuck with me. Closing thought: When today's 12-year-olds are turning gray and entering their anec-dotage, will they wax nostalgic about something digital they read, listened to or watched -- or created as their first Web page, Facebook account, blog, podcast or Twitter feed? I wonder. Will I ever actually redesign this page? During the summer of 2011, began updating this ancient page to HTML5 and CSS3 from the original 1999 table-layout version, which had grown full of an ugly mixture of in-line "font" codes, updated style tags and odd markup. Just to be retro about it, I'm still writing much of the new code with the Nano/Pico text editor directly on a Linux file server. Experiment with CSS styles, such as rounded corner boxes and "elastic" or "liquid" layout. Test on a wide variety of screen sizes and browsers. Originally kept a two-column layout for large screens; one-column for smaller ones. There were more... but when I stopped teaching they, strangely enough, became "academic."